Women are underrepresented in top positions everywhere in the world. Even in countries where more women participate in the labor market, only a minority makes it to the highest positions. There is a clear need to accelerate the movement towards greater gender equality, which is in itself an important development goal. Women’s economic participation is “a part of the growth and stability equation” (IMF, 2014). Gender-balanced representation in top economic positions is a fundamental element of gender equality around the world, and gender quotas have been widely advocated for achieving this goal (OECD, 2012). Yet, opponents of quotas argue that they violate meritocracy, with costly consequences for society. Norway pioneered the introduction of gender quotas for boards of directors in 2005, followed by Italy in 2011 and, more recently, by France and Germany. 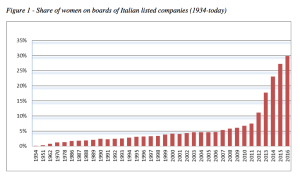 In Italy, prior to the introduction of gender quotas, top positions on the boards of listed companies were mostly held by men (92.5 per cent in 2011). What we know so far about the effects of board gender quotas is based on the Norwegian experience. The Norwegian law increased the number of women on boards up to the required threshold of 40 per cent, but was scarcely effective at reducing gender gaps overall (Bertrand et al., 2014), and it adversely affected the performance of companies and their stock market results (Ahern and Dittmar, 2012). However, Norway is a very particular case and a top performer country in gender statistics worldwide. Are the Italians doing it better? Contrary to Norway, Italy is a very conservative country with respect to gender equality. Under Law 120/2012, the so-called “Golfo-Mosca”, listed companies were required to include no fewer than one in five members of the less represented gender (women in this case) on the first board elected after August 2012 and no fewer than one in three in the following two boards. Unlike in Norway, the Italian quotas are temporary and gradual: the measure will be in place only for three consecutive board elections, i.e., nine years for each company, after which the obligation expires (Profeta et al., 2014). Figure 1 shows the slow increase in the share of women on boards in recent decades, which rose from 6 per cent before the law to the current level of 30 per cent. In this changing context, it is worth analyzing the consequences of the reform in terms of board composition, company performance, and stock market reaction. 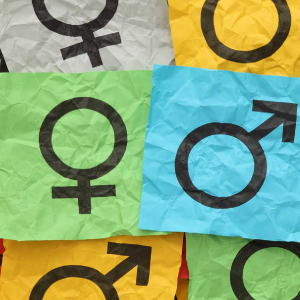 Our study addresses three research questions: 1) Did the composition of the boards and the characteristics of their members change after the introduction of gender quotas? 2) Did the performance of listed companies change after the reform? 3) How did the stock market react to the announcement and the introduction of board gender quotas? We collected and analyzed 4,627 resumés of board members (males and females) over the period 2007-2014 of the 245 companies that are listed on the Italian stock market and subject to the law. From these data we assessed the effect of the quotas on the selection process of board members, i.e., whether board characteristics changed afterwards. We also gathered and examined firm-level data for the period 2010-2014 on each company, and assessed whether the introduction of gender quotas affected the company’s performance. From the firms’ annual balance sheets, we took several indicators which are standard measures of corporate performance. They include: number of employees, production, profits, share of short-term and long-term debts, ROA (Return On Assets), Tobin’s Q (the standard measure of the value of a firm) and assets. Finally, we used data on stock market prices to assess the reaction of the stock markets on both the day when the law was proclaimed and on the date of the board elections. Our findings show that the new law caused more than a simple numerical increase in female representation (details in Ferrari et al, 2016). Three main features are worth mentioning here. 1) We compared pre- and post- reform changes in board member characteristics, such as gender, age, and education for each firm, while controlling for time trends. After the enforcement of gender quotas, the share of women directors increased (well above the required threshold), the average education level of all members of the board improved, and their age decreased. In table 1 we provide averages before and after the reform, just to give an idea of the magnitude of the changes. Precise estimates are provided in Ferrari et al, 2016. We did not find a significant increase in the values of the “bad” indicators, e.g. the number of board members belonging to the same family, or the average number of positions held by each board member. 2) We then assessed the causal effect of gender quotas on company performance. We used the reform period, which is exogenous to firms’ decisions about the composition of their boards, as an instrument for the share of female directors. As the introduction of gender quotas is very recent (two years), its long-term effects remain to be seen. However, in the short term, quotas in Italy were not associated with significant differences in company performance (unlike the Norwegian firms, whose performance worsened after the reform). Moreover, consistent with the existing evidence that a more gender-balanced team may be more risk-averse than a male dominated one (Bertrand, 2011), quotas apparently reduced the variability of the companies’ stock prices. 3) Finally, as we focused on listed companies, we measured the consequences of the introduction of gender quotas on the stock market. We used the “event study technique”, which is standard in the financial literature, and found that the stock market reacted positively to the introduction of quotas for board elections. We also show that the election of younger and more educated members was associated with better stock market returns, which suggests that the new post-quota boards are judged by the market itself to be of “higher quality”. Overall our results support the idea that gender quotas not only contribute to women’s empowerment, they may also encourage a better selection mechanism for the whole board through the entry of more qualified women. In countries such as Italy, dominated by a male gerontocracy, where top positions were not held by the most competent and most qualified people for the job (Bianco et al., 2015), the introduction of gender quotas and the consequent increase in competition resulting from the entry of qualified women has led to a beneficial restructuring of the boards, and this was positively received by the market. To be sure, women are the largest population group under-represented in top positions. but they are not the only one. As they are highly educated, they constitute an abundant reservoir of talent which is not fully exploited. This may not be the case for other groups, and in this event the imposition of quotas may indeed prove detrimental to advancement by merit and efficiency. However, the positive effects of the 2012 law in Italy suggest that it may be worth at least thinking about expanding its application to other categories, where reasonable and possible. Ahern, K. R., & Dittmar, A. K. (2012) The changing of the boards: the impact on firm valuation of mandated female board representation. Quarterly Journal of Economics, 127(1), 137-197. Bertrand, M. (2011) New Perspectives on gender, in Card D. and Ashenfelter O. (eds.) Handbook of labor economics, Vol. 4b, Chapter 17. Bertrand, M., Black, S. E., Jensen, S., & Lleras-Muney, A. (2014) Breaking the glass ceiling? The effect of board quotas on female labor market outcomes in Norway (No. w20256). National Bureau of Economic Research. 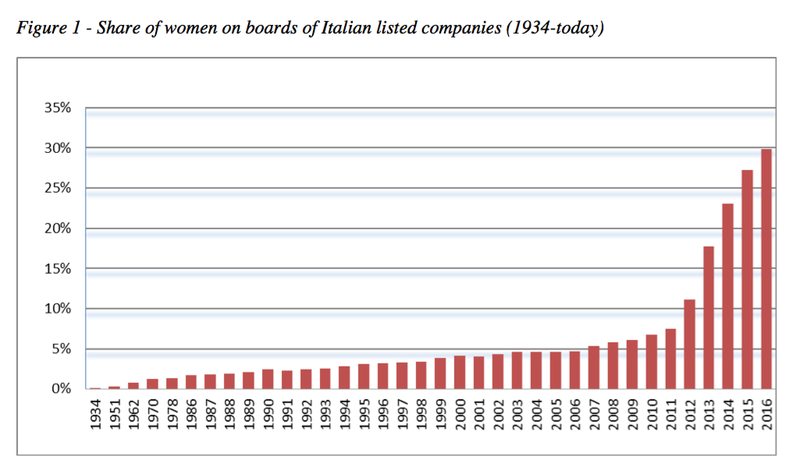 Bianco, M., Ciavarella, A., Signoretti, R. (2015) Women on corporate boards in Italy: the role of family connections, Corporate Governance, An International Review, Vol. 23, Issue 2, pp. 129-144. Ferrari G., Ferraro V., Profeta P., Pronzato C. (2016) Gender quotas: challenging the boards, performance, and the stock market, IZA DP No. 10239 September. IMF (2014) Annual report 2014. From stabilization to sustainable growth, IMF, Washington D.C.
OECD (2012) Closing the Gender Gap, OECD Publishing, Paris.